Who is stealing all the Bukowski and Kerouac novels? 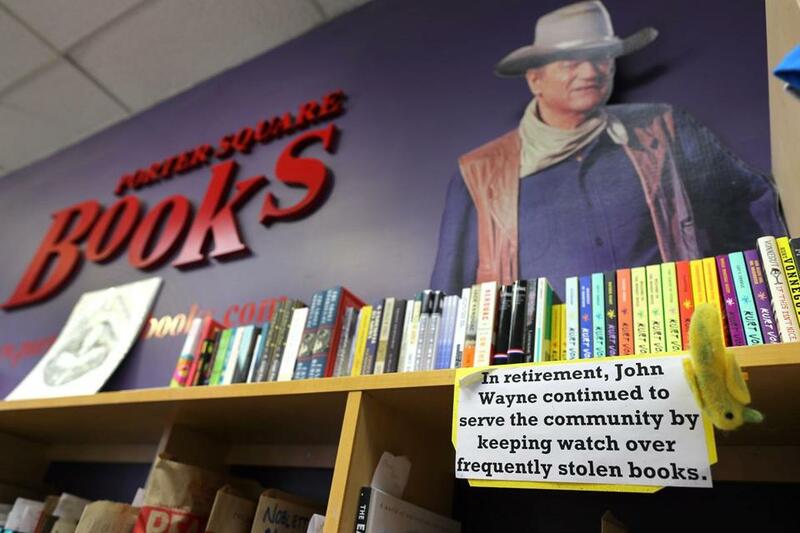 John Wayne keeps an eye on things at Porter Square Bookstore, which has contended with thieves making off with books. If it were a mystery novel, this would be the plot: Who was stealing some of the 20th century’s most iconic titles from the shelves at Porter Square Books? Six months ago, Mardell resorted to more drastic measures. She removed the most likely candidates for theft from the shelves altogether, tucking them behind the check-out counter beneath a cut-out of John Wayne for safekeeping and replacing their spots on the sales floor with small signs explaining their whereabouts. Such thefts are hardly unique to Porter Square Books. They’ve been happening for decades at Boston area bookstores and those in other major cities. The story line seems to always be the same: Bookshops are forced to keep a watchful eye on certain novels, namely those by the so-called “Beat” writers, a generation of stream of consciousness authors who bucked literary norms. There are a few prevailing theories to explain the book-swiping. People are either planning to resell the titles, knowing they’re used at high schools and colleges; or they’d rather spend $12 on beer than on a book for class. It could also be that as new generations of youngsters discover these authors, so too do they channel them, disregarding the mainstream and giving “the man” the metaphorical middle finger. The quantities aren’t vast, maybe a book or two at a time, spread out, but any theft can hurt a retail shop’s bottom dollar. “Little do they know they’re stealing from small, independent businesses that are affected by that kind of thing,” Flynn said. 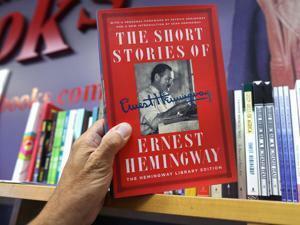 At Porter Square Books, works by Ernest Hemingway and F. Scott Fitzgerald have also been targets. The shelf behind the service desk where books by some authors are kept at Porter Square Books. A New York Times story from 1997 claimed bookstores across New York reported “paperbacks by a handful of writers, all of them male, 20th-century, and counter-cultural” being stolen with more frequency than others. On the list? The usual suspects, including William S. Burroughs. “Anything by Charles Bukowski has to be nailed down,” the Times said of the apparent trend. In 2004, the Harvard Crimson reported that Harvard Book Store, on Massachusetts Avenue, placed books behind the register, in order to prevent shoplifting. Not all shops say they have had to deal with the headache of reordering titles stolen by bibliomaniacs. Peter Win, co-owner of Brookline Booksmith, said theft is more of a “general thing,” and in his experience, there’s no particular book type or genre that gets lifted more than others. The Harvard Coop, in Harvard Square, has Bukowski crammed between other authors with the last name “B” on its shelves, while Kerouac’s prose sits on a lower shelf, right before an overflowing section of Stephen King novels.